It has been quite awhile since we last reviewed some products from Jetart Technology. Jetart Technology is a company that has been manufacturing innovative cooling solutions such as CPU coolers, hard drive coolers, and other PC peripherals. Jetart has also made some superb notebook coolers in the past. For example, the foldable Xcool NP6900, the Xcool NP5000, the Xcool NP4000 and the Xcool NP3000. Although their notebook coolers are not particularly sleek or suave, they are solid and dependable coolers that actually work as advertised. Recently, they launched a new notebook cooler. Although they are marketing it as a notebook cooler, it is actually a notebook stand. Designed for presentation purposes, the new Jetart Cool Stand allows you to prop up your notebook and swivel it in any direction you like. Of course, it will double-up as a notebook cooler, albeit a passive one since it doesn't come with any fans. 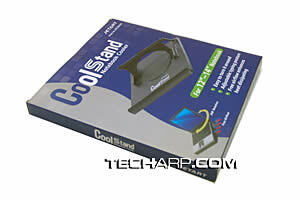 The Jetart Cool Stand comes in a simple cardboard box that is just about the size of the Cool Stand itself. The front of the box has a picture of the Cool Stand, and shows you its key features as well as the size of notebook it supports. The back of the box has a brief write-up about the product itself, some technical specifications and lastly some instructions on how to use it with a notebook. Well, pretty much everything that you need to know about the product are all printed on the box. So, you don't even need a manual. Inside, you will only find the Jetart Cool Stand. Nothing else was included or even needed.